There’s nothing kids like better than a space of their very own — somewhere to escape, make-believe and dream — that’s sized just for them. Playhouses and tents provide just such spaces and are a magical part of any childhood. 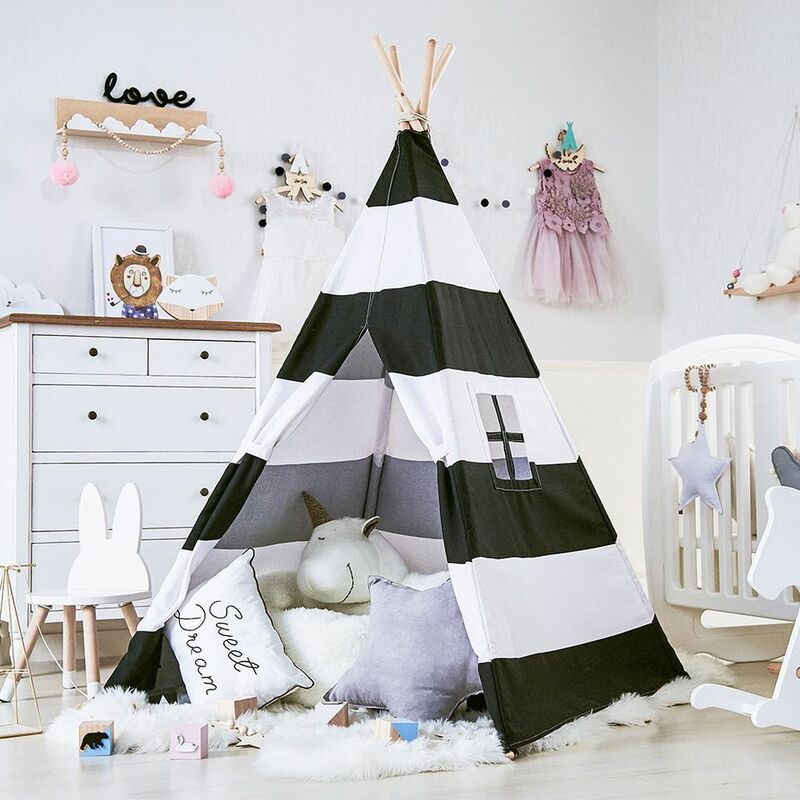 Sure, they can build a fort with the couch cushions or a sheet over the dining room table, but if you’re looking for a more permanent escape place for a little one, there are tons of adorable playhouses and tents out there in a variety of styles and prices. Here are seven of the best playhouses and tents for children. Inspiration meets igloo in this creative playhouse. Not only can kids crawl into their own personal snow cave, but they can decorate it any which way they choose. The cardboard igloo comes pre-printed with snowflakes and snow block detail in black and white, but then it’s up to little artists/Eskimos to add some color. They can paint it, color it, add glitter or spruce it up any way they want. Designing the igloo of their dreams is in their hands, and they don’t even need mittens to make it happen. It stands about 33" high, but there’s no measuring the countless hours of fun they’ll have creating and playing in this igloo. When playtime is over, it easily folds up so it can be stored in a snap, then pulled out again whenever it’s time for more igloo-inspired fun. Little princesses will light up with delight at the sight of this pretty pink castle playhouse. It’s extra sparkly too, as it comes with LED star lights for all sorts of magic making, day or night. It’s roomy enough for tea parties and other important princess business (it measures 55" x 53"), but it’s also lightweight. There’s a zippered carrying case too, so she can take it wherever royal fun is to be had. This playhouse can be used inside or out, and the details, such as white tulle curtains make it royally special. Recommended for ages three and up, this one is sure to be a favorite for any little girl. When a playhouse isn’t enough, there’s always the option of a play mansion. Cheap it is not, but this is one fancy palace. It comes in a DIY kit, so there’s definitely some assembly required, but when it’s complete, your kid will have their own dreamy Victorian mansion. Complete with gingerbread trim, it has 17 working windows that feature safety glass and screens. There’s a child-sized Dutch door (20" x 40") and even an adult-sized door (4' x 6') for when mom and dad come a calling. There’s a loft with a ladder and flower boxes to gussy things up even more. Heck, this place is so fancy, mom and dad might want to move in. They’ll blast off into a world of imagination and pretend play with this rocket ship playhouse. Perfect for those with stars in their eyes who dream of exploring space and all it holds, this will fuel hours of pretend play. It simply pops up, and the games can begin. A roll-down door lets them have some privacy, but also provides easy access as they crawl in and out. Made of sturdy polyester fabric, it can be used inside and out. It also folds flat and comes with a carrying bag, so you can take it to the park, beach or anywhere else your little explorer wants to travel. This plastic playhouse takes playtime to a whole new level. It features bells (a working doorbell), whistles and features galore that make for some serious fun. From a mailbox to a barbecue grill and wood detailing, this home has major curb appeal on the outside. Once you step through the (Dutch) door, there’s even more to explore. The kitchen is equipped with a table and a sink, and there’s a play phone, built-in shelves for storage and a wall clock. There is even a flower box for planting real or fake flowers. It’s roomy enough to allow several children to play (it measures 35" x 51" x 46"), and it can be used indoors or out. For a fun twist on traditional tents, a teepee makes a fun escape. It’s a great space for reading, playing and even perhaps taking a nap from time to time. Easy to set up and take down, it’s portable, and can fit in bedrooms, playrooms or even out in the yard. This black and white striped version offers a nice modern look that will fit in with most decor. There’s a window on the side, and the teepee door rolls up or down to make coming and going easy. It’s recommended for kids from one month to 10 years and is sure to get years of use. Wood is where it’s at with this cool, modern playhouse. With a mailbox, a door and window that open and close and even curtains, this house has everything but the kitchen sink. Wait, it actually has a play kitchen sink too! From parties to puppet shows, kids will find a plethora of uses for this playhouse. Recommended for kids ages two and up, it’s big enough (49.1" x 43.6" x 59.2") for several children to fit inside. Made of weather-resistant wood, it’s designed to withstand the outdoor elements and give kids a place to play outside. Some assembly is required, but once it’s done your kid will have a playhouse so awesome you may have trouble getting them in your real house.